Bet Motion Sports - The Home Of Sports Gambling And Great Bonuses! Calling All Bonus Hunters - Look What's Here At Bet Motion Sports! Bet Motion Sports launched in September 2008 by Vision Media Services in Curacao in the Dutch Antilles. They have over 90 different sporting offers that include pre match and in-play wagering, and also an online casino. The core of Bet Motion Sports customers are sports enthusiasts, and sports betting is offered on a global scale. They cover US NFL (Football), MLB (Baseball), NBA (Basketball), Hockey, International Soccer, Volleyball, Boxing, Formula 1 Car Racing, and Moto GP, Golf, Horse Racing, Tennis, Cricket, Cycling, MMA, and Rugby. All Deposits & Withdrawals are encrypted and 100% secure, and deposits can be made using MasterCard, Visa, Neteller, AstroPay, Click2andBuy, & Moneybookers. Withdrawals can be made using bank check, transfer or wire, or any of the deposit methods already stated, other than MasterCard. A Fantastic Choice Of Bonuses For First Timers! 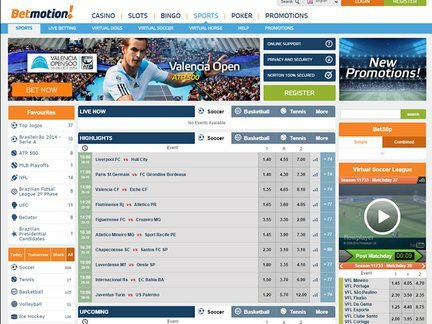 For those who like to review different sports gambling sites they'll be pleased to hear about Bet Motion Sports introductory bonus open to new players. They currently offer 150% bonus up to $150 or same in equivalent currency and whilst most gambling sites usually require the bonus and the deposit to be rolled over many many times before the funds can be withdrawn, at Bet Motion Sports for bets over 1.8 odds, the deposit and bonus is only required to be rolled over 5 x! Interestingly, the new player has the choice of a different bonus if they prefer. This second offering is a 100% bonus up to $350 on the player's first and second deposit of $20 or more. Although it cannot be combined or utilized with any other offer, signing up for this bonus offers a maximum payout of up to $700! Such are the choices that avail themselves for those smart enough to shop around and be lucky enough to stumble across this site! Take a closer look at their impressive site and take action whilst these great eye catchers are still available. Who knows how much longer they will be here for, grab some of the action now, while it's still on offer!